November 22, 2018 10:29 am. 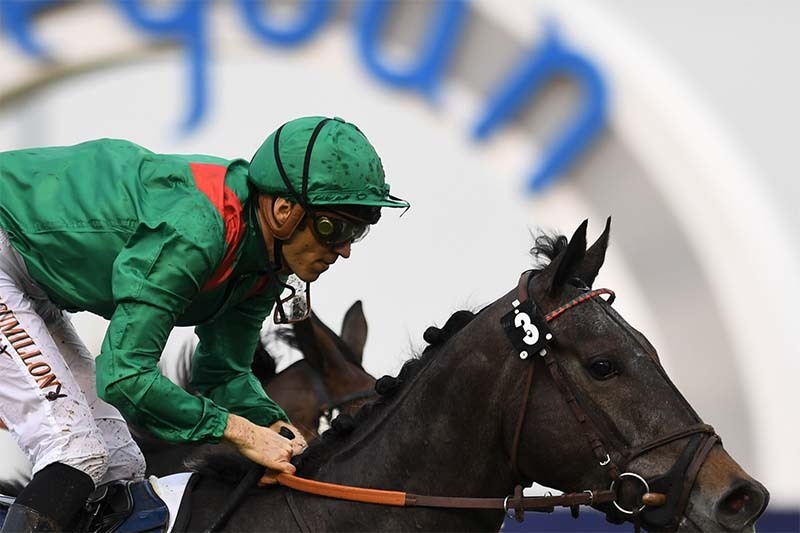 Racing at Meydan’s seven-race Thursday card is highlighted by the return of highly regarded Cosmo Charlie in the same 1600m rated conditions event he won 12 months ago en route to the Dubai World Cup Carnival. The co-feature of the evening is Meydan’s first Purebred Arabian feature of the season, the Group 2 Bani Yas over 1400m, in which RB Torch will attempt to defend the crown he won last year. One of five in the race to be saddled by local champion trainer, Doug Watson, in the 1600m gulfnews.com feature, Cosmo Charlie has only ever raced in the UAE, making a winning debut as a 2-year-old in a 1400m Meydan maiden in December 2016. In the March of the following year, he landed the middle leg of the UAE Triple Crown, the 1900m Al Bastakiya (Listed) and made a victorious comeback last season in this same feature. A 4-year-old gelding by Stay Thirsty, his best effort at the 2018 Dubai World Cup Carnival was a second behind Heavy Metal in the 1600m Firebreak Stakes (Group 3) before finishing his campaign with a Jebel Ali victory over 1400m. Unlike 12 months ago, Cosmo Charlie has the advantage of an outing this season, albeit a slightly disappointing one in which he reportedly suffered minor cuts, having run at Jebel Ali on the very first day of the season four weeks ago. Stable jockey Pat Dobbs has chosen him, while Sam Hitchcott, also based at Red Stables with Watson, is aboard Thegreatcollection. “Cosmo Charlie looks our best chance, along with Thegreatcollection,” Watson said. Watson also saddles Active Spirit for the EERC (Emirates Entertainment Racing Club) with Tadhg O’Shea in the saddle. Completing the trainer’s quintet are Ertijaah (George Buckell) and Nathr (Fernando Jara). The latter pair are both owned by His Highness Sheikh Hamdan bin Rashid Al Maktoum, but his retained jockey, Dane O’Neill, has opted to partner Taamol for Ali Rashid Al Rayhi. They teamed to win a 1400m Meydan handicap a fortnight ago. Sandeep Jadhav is another trainer well represented and, from his three runners, Royston Ffrench sides with Montsarrat, which leaves Xavier Ziani to ride Hornsby and Richard Mullen in the saddle aboard Syphax. In the 1400m Bani Yas sponsored by Gulf News (PA Gr2), RB Torch is the choice of Pat Cosgrave from two runners to be saddled by Eric Lemartinel for His Highness Sheikh Khalifa bin Zayed Al Nahyan. The stablemate, Mawahib, will be ridden by Fabrice Veron and appears to give the Al Asayl team a strong hand. Watson saddles both Foaad, the mount of O’Neill for Sheikh Hamdan and new recruit RB Madymoiselle with Chris Hayes aboard for Mohd Habib Al Redha. “RB Madymoiselle is a new horse we are learning about, but has a terrible draw in 12,” Watson said. Jean de Roualle saddles Mirna for Yas Horse Racing Management, who looks sure to be competitive under Richard Mullen as should Sam Hitchcott’s mount, ES Ajeeb, for Ibrahim Aseel. The latter is drawn widest of all in 14 and represents the Khalid Khalifa Al Nabooda, Ernst Oertel and O’Shea combination that has enjoyed a bright start to the season. Dubai World Cup Carnival (#DWCCarnival) aspirants, headed by the Watson-trained Ejaaby, have the chance to advertise their credentials in a 1200m handicap, the Friday. One of five in the field of eight owned by Sheikh Hamdan, he is the choice of O’Neill. Having opened his account as resident trainer at Jebel Ali Stables for His Highness Sheikh Ahmed bin Rashid Al Maktoum last week, Nicholas Bachalard will be hoping Final Reckoning can provide him his first Meydan victory since, from his previous base in Saudi Arabia, Nashmiah won the 2017 UAE 1000 Guineas. Both Meydan juvenile maidens thus far this campaign have been won by youngsters making their debut, trained by Ahmad bin Harmash and ridden by Connor Beasley for the Phoenix Ladies Syndicate. Thus, there will be much interest in their debutante Ariette Du Rue, who faces nine fellow juveniles in a 1400m fillies’ maiden, the Inside Out. A daughter of Street Sense and descendent of the great undefeated racemare Personal Ensign, she is bred to relish the dirt surface. She is also a half-sister to four winners, including the very useful pair Cymric and Lismore. For the same owners, Bin Harmash also saddles a second debutante, Lady Winslow, with Antonio Fresu in the saddle. A daughter of the very talented Winslow Homer, she is the second foal out of Speaking Role, a Singspiel full-sister to Group 3 winner Miss Singhsix. Of their eight opponents, two have previous experience, including Queen Monaco, who was a distant third to Phoenix Ladies’ Superior over 1600m a fortnight ago for Helal Al Alawi. A local debutante, Al Hayette boasts a second and a third from three starts in England for Ismail Mohammed, who also owns her. Of a Satish Seemar duo, Richard Mullen has chosen Lady Parma, a daughter of Exchange Rate and sure to have a big following in the colours of The Parmar Family, avid supporters of UAE racing. Exchange Rate, a son of iconic stud Danzig who passed in January 2016, was a graded stakes winner who embodied versatility; winning and placing in graded stakes sprinting and routing and on both dirt and turf. Lady Parma is out of the Dynaformer mare Angle and boasts a pedigree flush with classic-distance influences on both surfaces.